Janet Kurnatowski Gallery is pleased to present “Paper Works,” a salon-style survey of new and recent work on paper by gallery regulars and dozens of other New York- area artists. While the preeminent impulse guiding the exhibition is drawing, variants on painting and printmaking appear as well, and certain works even engage sculp- tural concerns. 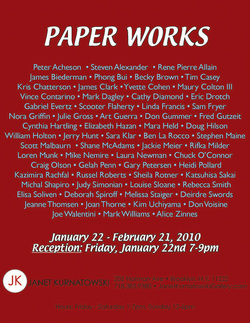 “Paper Works” advances no particular aesthetic position, promotes no agenda, other than to celebrate the distinctive characteristics of work on paper—intimacy, immediacy—and the seeming paradox therein embodied: that a primary engage- ment with materials simultaneously generates and tests visual ideas. The degree of “finish” varies widely among the 85 pieces in “Paper Works.” For some artists, such as Russel Roberts, Craig Olson, and Laura Newman, improvisation is cen- tral. In the work of Gabriel Evertz, Gary Petersen, and Don Voisine, exploration is balanced by exquisite control. But throughout the exhibition, the pleasure the artists clearly take in making is fundamental to the viewers’ delectation. The show runs till February 21, 2010. For more information or images please contact the gallery.